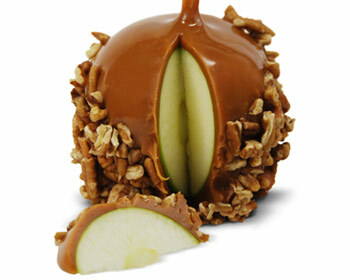 A fresh Granny Smith apple drenched in homemade copper-kettle caramel and adorned with pecans. 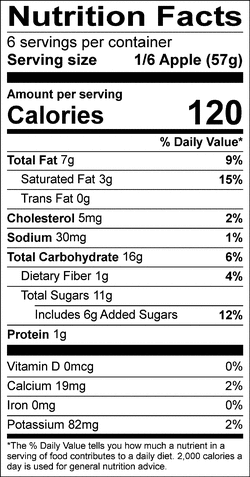 INGREDIENTS: apples, pecans, corn syrup solids, water, sugar, evaporated milk (milk, dipotassium phosphate, carrageenan, Vitamin D), cream powder (cream, nonfat milk solids, sodium caseinate), butter (cream, salt), palm oil with soya lecithin, salt, vanillin - an artificial flavor. CONTAINS MILK, PECAN, SOY. PRODUCED IN A SHARED SURFACE FACILITY THAT PROCESSES: PEANUT, TREE NUTS, EGG AND WHEAT.